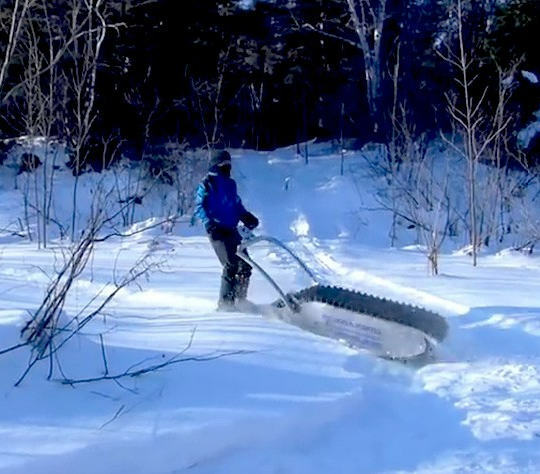 A quick kit for converting road going 2 wheel drive trucks into tracked snow capable machines. We've seen kits for 4x4 trucks, however, this one is the most convenient that I've seen. With a combination of skiis and tracks built into each wheel drive unit, the stock wheels can generate plenty of propulsion when paired with low ground pressure and high traction. I'm not sure if slippage of the tire on top of the track unit is a problem. Each Track N Go kit comes with four track units and two loading ramps. To attach the tracks onto the vehicle, place the tracks in front of each wheel on the ground with the ramps leading up to them and simply drive forward onto the units and clamp them on. 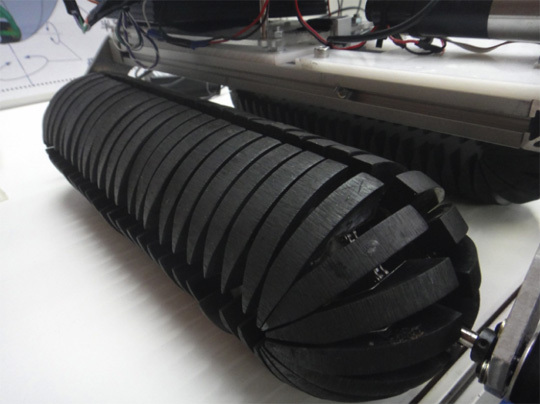 Rubber rollers integrated on the device ensures the tire stays aligned side-to-side for steering. These look to be a bit less robust than other full track bolt-on kits; however, the convenience factor is high. I like that one could drive a truck to a location and then easily affix the tracks when the snow becomes deep enough to warrant it. This creation by Yvon Martel functions as a personal locomotive to aid in all kinds of weight pulling. It is a tracked unit containing batteries, electric propulsion, and control unit. 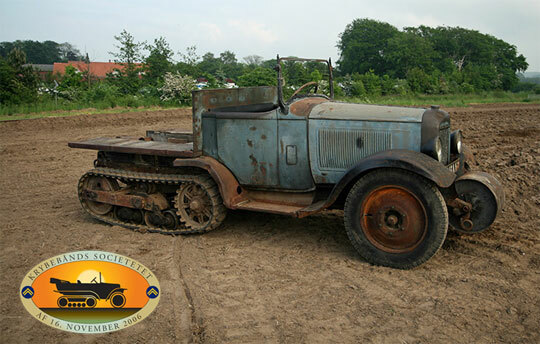 The Creeper Track Society is restoring a Citroën Kegresse P17E half-track vehicle. These fellows are carrying out the restoration in detail and documenting the process on their website: Creeper Track Society. I'm very interested in the process -- and the excellent skill and dedication of the team -- as they show their work restoring the boogies to building their own track replacement from scratch. What a great example of custom vehicle hacking. 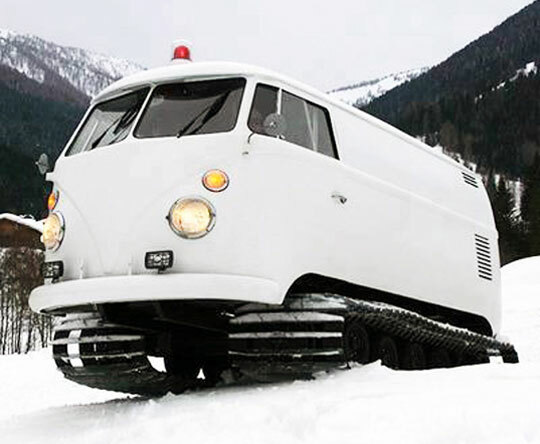 Bernd Berger has taken an old, derelict, 1966 Volkswagon van and combined it with the running gear from what looks like a small Prinoth tracked utility vehicle. 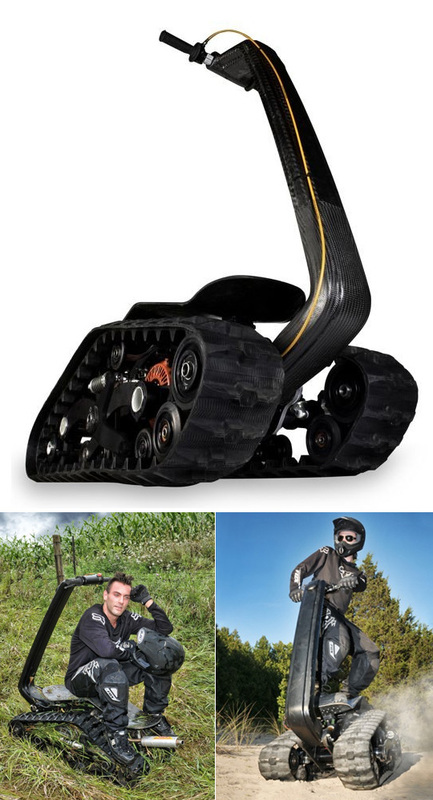 Interesting find on the web -- the DTV Shredder motorized personal track vehicle. 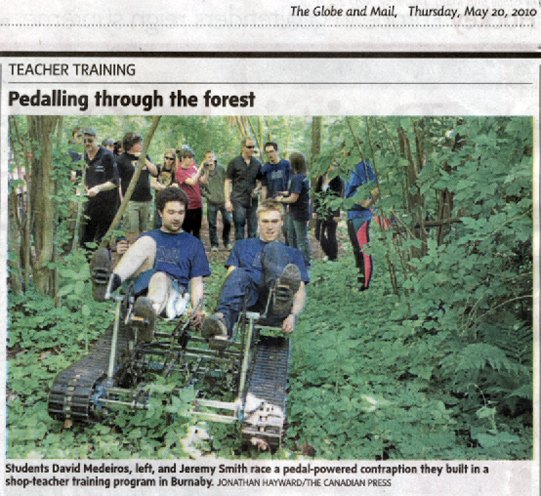 The prototype was designed and built by fellow Canadians BPG Werks located in Brampton, Ontario. They claim to have financial supporters for civilian and military applications and expect to be in production in the next 18 months or so. 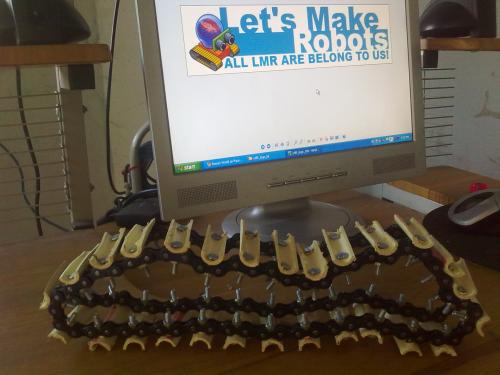 Discovered this page where some robotics enthusiasts made their own tracks out of bicycle chain, PVC pipe, and bolts. Looks like an effective design and I'd like to see it in action!